The story of the Zodiac saga contains many chapters and mini-mysteries regarding the killer’s possible connection to other unsolved crimes and other strange writings. Perhaps the most enduring and controversial theory links the Zodiac to the 1966 murder of Cheri Jo Bates in Riverside, California. Tom Voigt of the website Zodiackiller.com, and Zodiac-theorist Howard Davis, (in his book The Zodiac/Manson Connection), both state that another envelope was postmarked on the same day, April 30, 1967. No one can account for the possible contents of this envelope or explain why this envelope had been filed away with material related to the Bates case. Another odd letter became the subject of debate and controversy and its origins have remained a mystery for more than four decades. Your human interest story (Oct. 1, 1967) about Cheri, the RCC girl that was killed, was very interesting. Perhaps a story about the boy that killed her could be more rewarding. If people were to read of the life of a boy that turned killer, they might stop to think about the lives of their own children. “Are we laying the blue print for another killer?” might be one of the questions brought to mind by such a story. 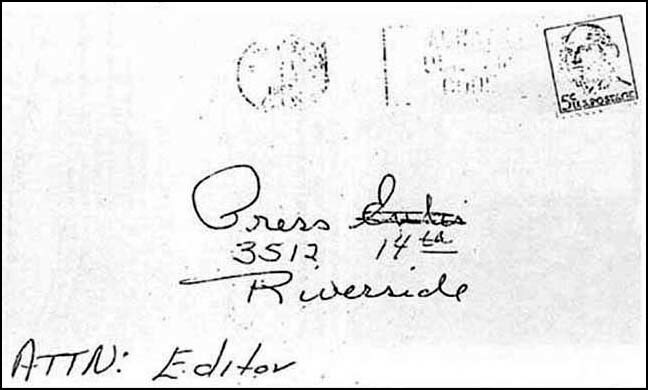 In the years since the Hautz letter was mailed to The Riverside Press-Enterprise newspaper, some observers have suggested that the author may have been the same individual who killed Bates, or perhaps even the Zodiac himself. Some theories cited the use of the name “Hautz” with a prominent letter “Z,” while others claimed the tone of the letter reveals the author’s “cold” and insensitive personality. Efforts to locate the Patricia Hautz in question consistently failed, fueling suspicion that the name was simply invented by the author of the letter. While many people seemed to believe that the letter had sinister origins, I believed there was a simple explanation behind this mysterious message. I suspected that the Hautz letter was exactly what it seemed to be– a letter from a young student who asked the eternal questions: What sort of person could kill and what would drive that person to do so? Like many others, I had tried to locate Patricia Hautz over the years but my efforts proved fruitless. Several months ago, I spent many hours on the phone with the patient and generous workers who keep the records for various high schools in the Riverside area but I was unable to find the right Patricia Hautz. I had given up my search when I received an email from a man who explained that he had once known a woman named Patricia Hautz, and his recent attempts to locate her using the Internet had led him to my website and the controversy regarding the Hautz letter. He said of the letter, “That sounds like her. She was always commenting on stuff.” The man then provided some background information which helped to explain why so many people had been unable to find Patricia and, using this information, I subsequently located the woman in question. 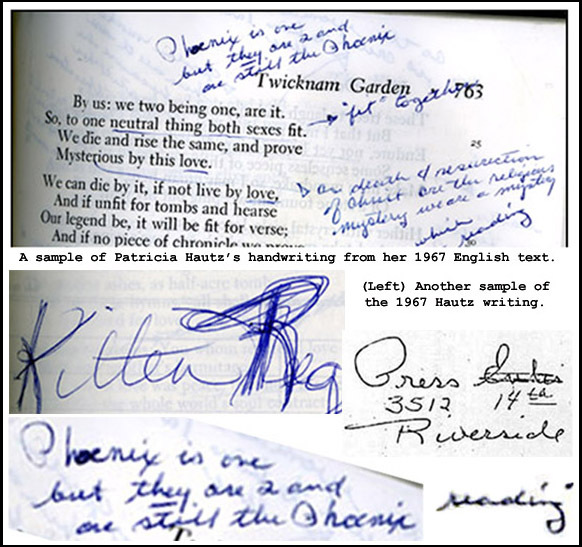 After examining Patricia’s handwriting samples and comparing the writing with that on the envelope mailed to the Riverside Press-Enterprise, common sense, logic, and facts led me to conclude that Patricia Hautz was the author of the Hautz letter. Patricia Hautz was very generous and helpful, but she has no desire to become swept into the controversy and she wanted to avoid any publicity. Now living in another state under her married name, Patricia asked that I respect her privacy, and she was aware that doing so would be difficult given the circumstances. She wrote, “Since my maiden name is out there, I don’t think there’s much you can do.” I hope that the readers will respect Patricia’s privacy. – Read more about the unsolved murder of Cheri Jo Bates in the previous blog entry titled CHERI JO BATES and The ZODIAC: Unsolved Crimes and Unanswered Questions.